How do you write for the web? Recently I’ve been asked about writing on the web. Who are the experts? What are they doing? Have things changed? From what I have read and know, writing for the web has changed. Not in the fact that if you write simple and clear, use space and short sentences for scanning, create original work, etc… but more around the search engines algorithms. Google (recent Panda and Penguin updates) and Bing are going after spam and they are watching out for things that don’t look natural. You know, the Black Hat SEO tricks that may cause you to write in weird ways like keyword stuffing. BTW, Matt did an interview with Stone Temple on what makes a quality site. You should take the time and quickly read through it. When it comes to writing on the web, follow some simple rules – more in depth explanations are on Copyblogger but I love this list of their Brilliant Writing Tips. Have something to say…means original content. Keep paragraphs short. Think of how hard it is to read dense text on a mobile device. Don’t be redundant or repeat yourself. Don’t forget the headlines. They are so important. Here’s some info on Headlines: 8 words or less and how they work on the well. If you are looking for topics to write on, use what you know. And look for trends on Google Trends or in your field of study. What’s trending now? You can even use Twitter if you want. One of my favorites for finding out what to write about is answering the questions people send me in email. That’s exactly how this post came into being. Writing on the web isn’t hard – it’s more about getting as much original content up on the web about your program, school, dept, etc… as necessary. If you are stumped on web writing, I’m sure our Mike Roe (our copywriter) can help you out. He always helps me. What do you think? Do you think it’s hard to write for the web? Is the “best kept secret” a myth? If no one knows about you – you need a plan. I dislike when people tell me they are the “best kept secret”. You are not. Unless you want to be. If you say you are the best kept secret, it’s because you don’t know how to tell anyone about what you are doing. And don’t blame your website. It’s not it’s fault. Well sometimes it is. Sometimes your website can be invisible to the search engines and that is something you need to change right away. How to know if your website is invisible? Check it with http://webconfs.com/search-engine-spider-simulator.php. Run the simple test. If the spider simulator can see your website, then it’s probably not the website’s fault that you aren’t being noticed. I would also recommend linking your website up with Google’s webmaster tools. If you do have a website problem, there are many solutions out there that can help you solve it. If you have a small farm or business, then I would recommend wordpress. Yes, lots of people use wordpress for blogging but you can also set up simple websites without a blog (just remove it – though I don’t recommend removing blogging because it is the best way to get ranked by search engines). It’s very affordable (just buy the domain name and hosting) and you’ve got a great system on getting a website up and running in no time. Best kept secrets can be solved simply. And here’s the most likely problem. 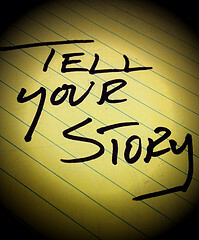 You aren’t producing enough content (text, photography, video, etc…). Or let me rephrase, you aren’t producing enough original content and then taking the steps to make sure people know about it (doing enough outreach via advertising or word of mouth). So if I was in charge of farm or small business and I needed people to know who we are and what we do, I would put together a strategic plan and then an editorial calendar. Strategic plans are not brain surgery. They take some work but it’s nothing too hard. Some of the research on your target audience may take some time or if you don’t have time, then it will take some money. But having that research is invaluable to your strategic plan and ultimately your communication efforts. Here’s what I believe should be in your strategic plan or at least these basics. What would you consider a communication success? This is your marketing goal or goals. Who would you like to communicate with? This is your target audience. Can you describe them in detail? What do you want them to know and when? Given what you want them to do, what do you think is the best way to tell them about it? This is your messaging. Keep your message short and simple so people do not get confuse about what you are trying to communicate. What would you like them to do? This is your call to action. Be specific. Is someone else out there doing the same thing you are? These are the people that are in direct competition for the attention of your target audience. This is your competition. If you want to call this a SWOT (Strengths, Weaknesses, Opportunities, and Threats) analysis you can. How are you going to measure if it’s working? Each tactic should have a way to measure it to see if it is working. Remember all measurement must point back to your overall communication goals. Again, this isn’t hard but it does take some time and energy. But once it is done, it will help to guide you on all the decisions you need to make when it comes to communications. And believe me, it can help tremendously when you are trying to make decisions about getting into social media. Did I miss anything? Do you have anything to add? Why can’t I use paper for notes anymore? Taking notes on paper is worthless to me. Why? Because I can never find the paper I used and if I can, I can’t search through it in less than a second. Personally, I don’t remember what I did with my notes before I had Evernote. I believe I used Gmail and Google Docs to take notes but many times I didn’t have an internet connection and therefore would have to take the notes by hand. Then I was stuck with paper notes and I would always lose them right after the meeting before I had time to transcribe them. My desk can be a bit messy. I tried to put paper notes in folders or keep the same notebook but I would almost always forget to grab the right notebook when rushing to the next meeting. Then I would take notes in whatever notebook I had with me. This led me to ripping the notes out with a tear or forgeting which notes were in which notebook. And the cycle continues. Evernote has changed all of that. It doesn’t matter which device I have – it has Evernote on it. My iphone, my ipad, my macbook. Of course, I’m a Mac guy so it’s easy with the apps but it’s good with Android as well. And you always have the web version. And I can still take notes with by handwriting (with Penultimate and my Jet PRO pen) and it gets saved in Evernote. 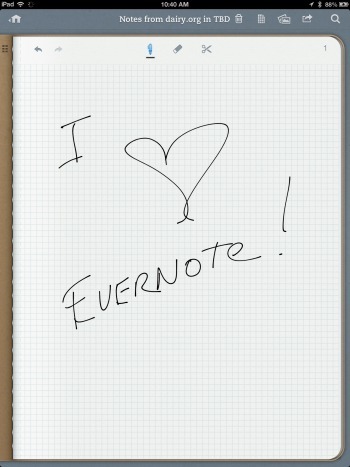 Do I recommend evernote? You bet I do. Does it save me time? Yep (search, tags and notebooks). Want to know how all that works? Check out Michael Hyatt’s tutorials or you can learn directly from Evernote. What’s the worse thing about Evernote? When I forget to put notes in it. Because then I have no idea where the notes might be. But that rarely happens anymore. What do you take notes with?